Averages and statistics mean little just three games into the season, though they do still mean something. While it’s difficult to make definitive statements — especially when two opponents were SWAC members — it’s still worth noting how players have fared in the early going, and may provide some insight toward Buzz Williams’ rotation that was criticized by some after the Ohio State debacle on Saturday. Though offense was lacking, the Golden Eagles did a fine job slowing down the Buckeyes’ scorers, resulting in 52 points over a 70-possession game. Through the first two weeks of the season, Marquette is ranked in the 91st percentile defensively, including the 93rd percentile while in zone, which they used primarily against Ohio State. Here’s a look at how each Marquette defender has fared. — Jake Thomas’ numbers should jump off the virtual page. The redshirt senior’s stellar defensive numbers have helped to somewhat shadow his 4-of-17 shooting. Andrei detailed last week that Thomas was beat off the dribble just one time and rebounded well — he had four boards against Ohio State. 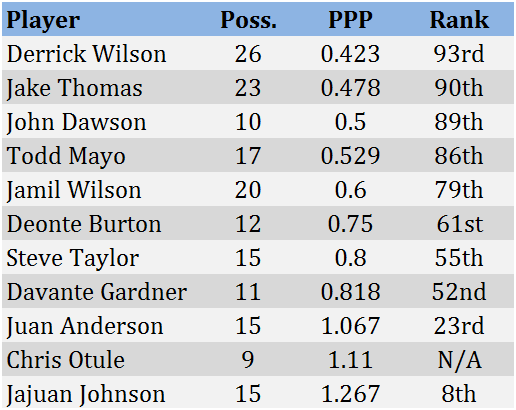 — This outlet has been highly supportive of Derrick Wilson to this point, and these numbers should do him some justice. Not only has he faced the most possessions against opposing defenses, he’s also done the best job defending his attempts-against. He could do better than two steals and his offensive numbers have to improve going forward, but don’t forget that he’s the Golden Eagles’ best defender. — For those clamoring for Jajuan Johnson, this might provide some help. The freshman is an incredible talent and has shown a knack for scoring, shooting and using his athleticism when needed. Defensively, he needs some help. Williams has always said that freshmen must prove their worth defensively, and, at least by these numbers, he still needs to do that. — Chris Otule’s defensive numbers the last two seasons have done well, so don’t take these numbers for too much. Still, Otule struggled some against Ohio State’s big men and slashers and had just three rebounds in 17 minutes. The sixth-year senior was superb in these numbers last year, and as the games move on and Otule continues to find his role on a new team he’ll be back toward the top of this list. — John Dawson did not play against Ohio State, so his percentile rank and possessions are a bit misguided. Still, it’s a plus, albeit an expected one, to see his numbers look this good against weaker competition. — A year ago Todd Mayo was in the 8th percentile in this statistic, allowing 1.0 points per possession-against. Again, it’s just three opponents, but Mayo has been very good defensively. Remember, the percentile rank also means these numbers include all players from all teams, likely other players on teams that have played cupcakes. His 86th percentile is a great start to the season. Now you’ve seen our (over)reactions. Let’s hear yours.